Food trucks have always fascinated me. Whenever I’m in downtown Vancouver, I always make it a point to check at least one out if I can, since they have such a fabulous (and wide) variety of them. 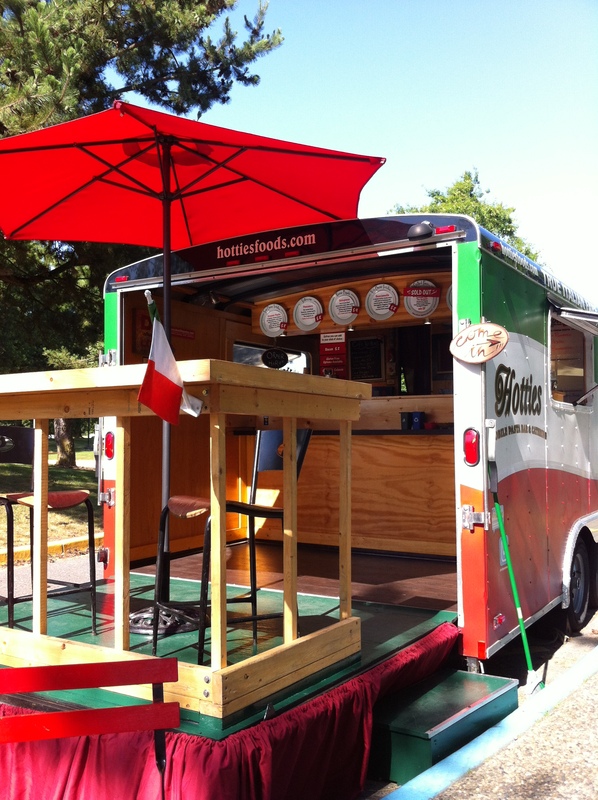 Not that long ago, I went to the Langley Community Farmers Market to pick up some produce, and I noticed Hotties Mobile Pasta Bar. The name immediately caught my interest. It was relatively close to dinner time and I hadn’t had time to eat lunch that day, so I was starving. I love the look of their trailer – it’s not your standard boring food cart – they have wood paneling on the walls and several places to sit – both on the cart itself and on cute little tables and chairs beside it. They also have a great selection of pastas (made fresh!) that you can order, all for a very reasonable price. I had a chance to talk with two of the staff members working there while I waited for my food to cook, and they were super friendly and willing to engage with their customers, which is always awesome. 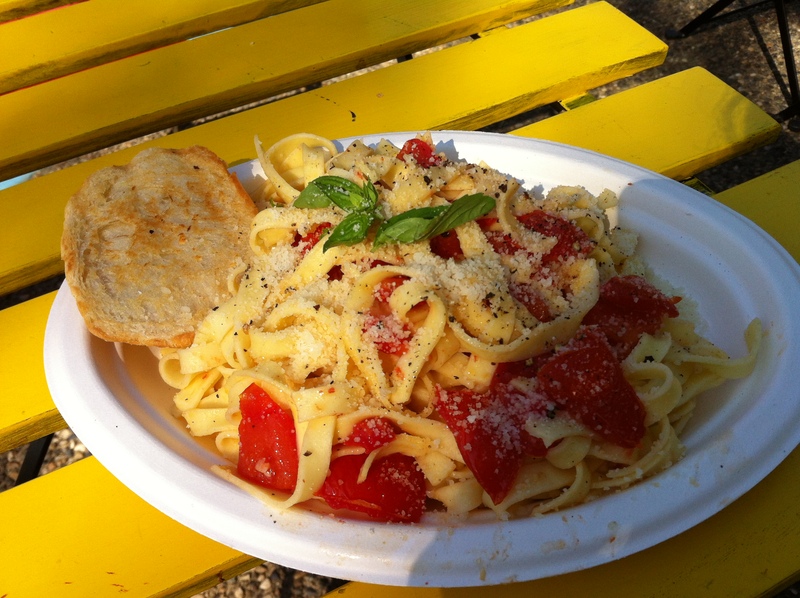 I ordered the Fettuccine Pomodoro, and it was fabulous! The pasta was cooked to perfection and the tomatoes were delicious. I loved the pop of flavour that the basil provided. Plus, it just looked so pretty! Hotties is definitely a food cart worthy of checking out. They post their schedule on their website (as well as on social media), and they’ll be back at the Langley Farmers Market this Wednesday. For many years I’d drive past the Hilltop Diner Cafe in Langley (on Fraser Hwy, near 240th St), and wonder about what was inside. I never had the courage to go in because I (wrongly) assumed it was a junky old place with super greasy food. Appearances can definitely be deceiving. I’ve been there several times now, and I think it’s fabulous! The diner has been open for over 65 years, which is a pretty impressive feat. It’s small and there’s limited parking outside, but it’s very cozy inside. The staff are all very friendly and welcoming, and the diner has a great small-town vibe about it. The decor on the walls is fairly minimal, but it is your classic diner-style decorating. I don’t think much has changed in all 65 years of them being in business, and there’s nothing wrong with that! When you walk in, you’re greeted by one of the ladies at the counter and can find yourself a seat wherever there’s space. They offer you coffee or another drink when they bring you your menu, and your cup is never left empty for long. I’ve only been there for breakfast, so I can’t speak to the lunch items they offer, but their breakfasts are incredible. The portions are huge and almost everything’s made from scratch. Some dishes to highlight would be their pancakes which are fluffy and enormous, to their huge pieces of French Toast and their omelettes. My favourite breakfast dish that I’ve had so far are their Benny’s. There are several options you can have for the meat – homemade sausage, bacon, ham, or if you don’t want meat you can get a grilled tomato. They cook the eggs to your specifications, there’s plenty of fabulous Hollandaise sauce, and their hash browns are phenomenal – chunks of crispy fried potatoes with green onions. Yum!! 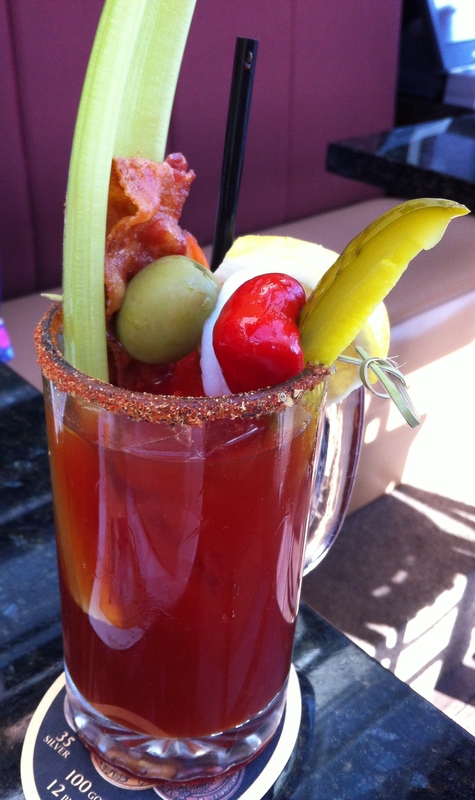 The Hilltop Diner is open daily from 8:30am to 2:30pm. If you go there for breakfast and don’t want to have to wait for a table, I highly suggest getting there earlier in the morning, as it really begins to get busy around 10am. 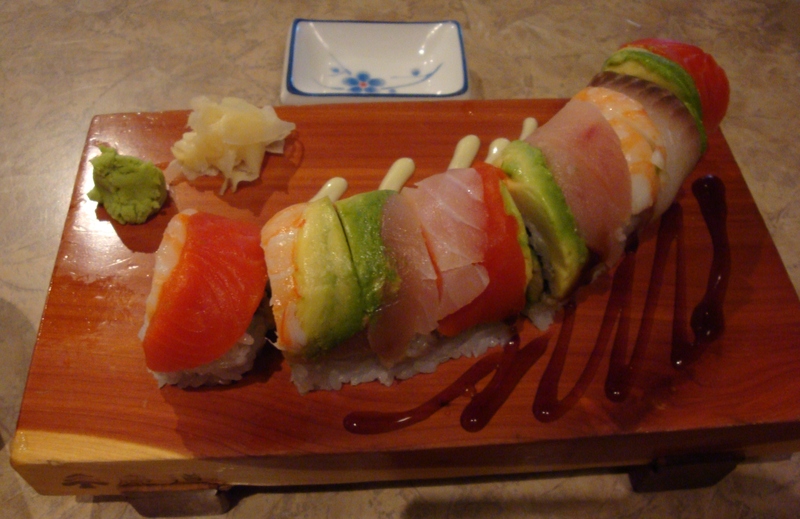 Recently I went for lunch at an excellent sushi place in Langley called Damiko Sushi. They’re located on 200th Street, just past 72 Ave in a little strip mall right next to the Esso gas station. The location is a bit difficult to get to, as you can only access it by going North on 200th, but don’t let that deter you from going! The restaurant is a bit on the small side, so if you are going with a group or during meal rush hours, it is definitely a good idea to make a reservation. I decided to try their Fancy Roll, and it was indeed pretty fancy! The colour and presentation of this roll was amazing. The Fancy Roll has “crab meat, avocado, cucumber inside. Topped with salmon, tamago and masago.” For those not familiar with Japanese words, tamago is grilled egg, and masago is a kind of fish eggs/caviar. There were three different colours of masago – black, green and orange/red-ish. I’m not sure what the sauces were that were on the plate, but they added some great flavour to the rolls. I really liked this roll, and was surprised at how filling it was. Normally I would get a side order of Miso Soup or Sunomono, but this dish was plenty. 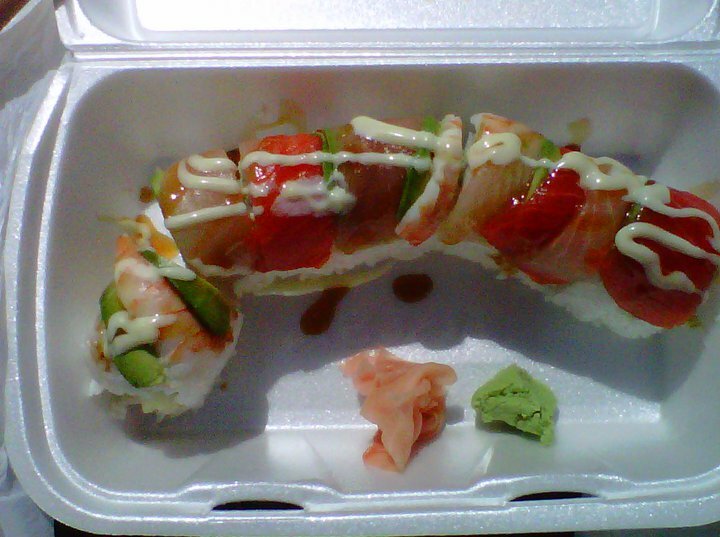 Others in my group had (and enjoyed) the Spicy Ichi Roll, Chicken Teriyaki Lunch Box, and the Salmon Teriyaki. One of my friends comes here regularly, and thinks their Miso Soup is some of the best she’s ever tasted. The prices are very reasonable, and the service is quick and wonderful. Their entire menu is available for take-out, plus they also do catering as well. They’re open daily from 11:30am to 9:30pm. Quite impressive hours for a restaurant in the Langley area! I definitely recommend giving it a try sometime! 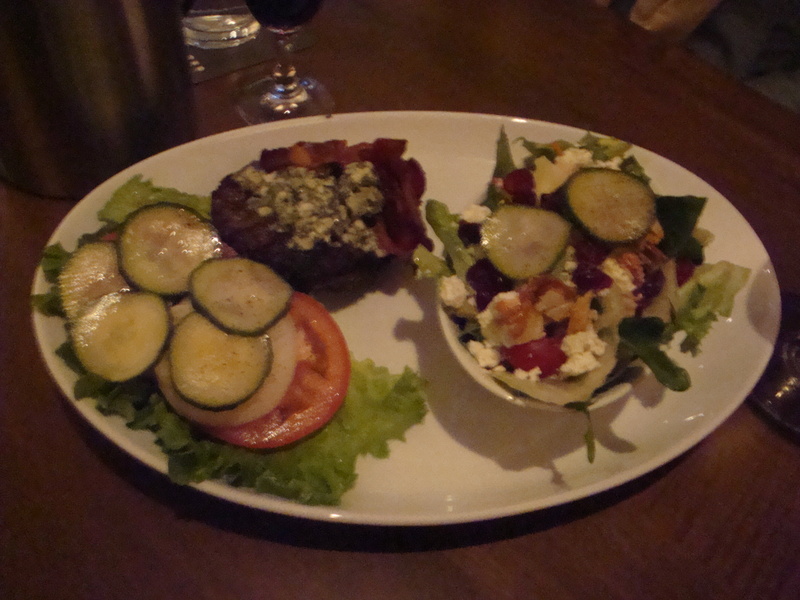 Recently I went to a restaurant in Cloverdale called The Vault. I’d been there once before about a year ago, but that was for dinner. This time a friend and I had lunch. I really love the look of the restaurant. It has high ceilings with wooden beams, and there’s a big mishmash of decor on the walls. I’m pretty sure that the restaurant’s name comes from the fact that there is an actual vault at the back of the place that people can be seated in. We were there at a reasonable hour for lunch, but the place was pretty empty. The time I was here for dinner, there was a band playing on their small little stage, so the place was packed and LOUD. It’s a great place for a meal or for drinks and snacks, but if you’re there on a night with live music, don’t expect to be able to hear conversation easily. 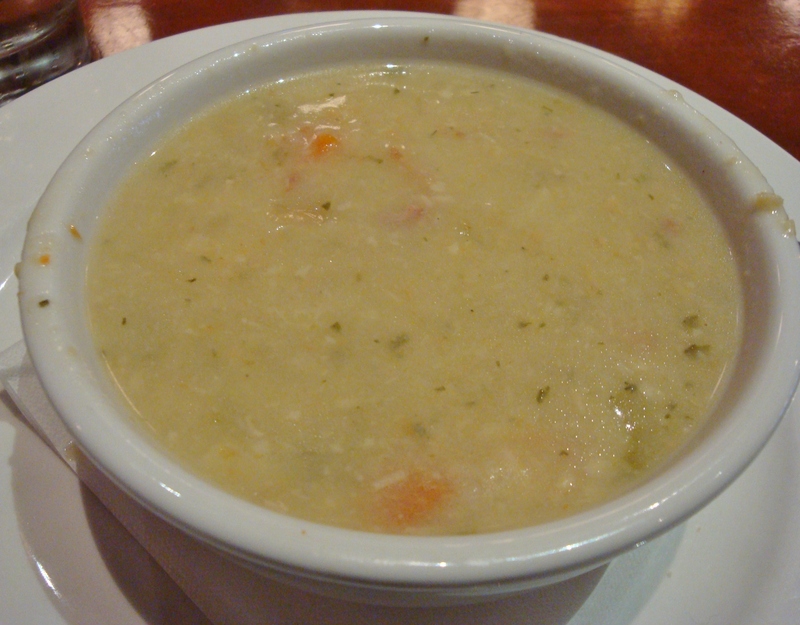 I ordered the soup of the day, which was supposedly a Scallop Chowder. I’m not sure if I misheard the waitress, or it actually WAS what I heard, but it really didn’t taste like it. 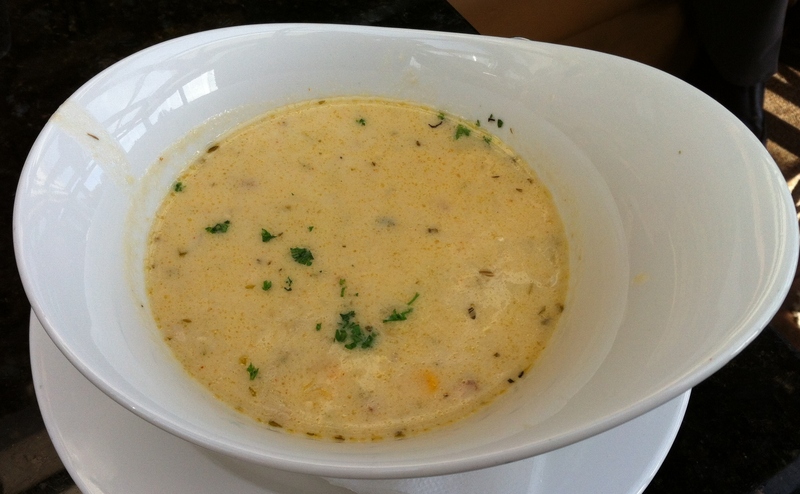 That’s not to say that the chowder wasn’t tasty, because it was. There were chunks of potato, vegetables, bacon, and I think I tasted one clam, but it was hard to say. There weren’t any scallops as far as I could tell, though. I wasn’t too disappointed since the flavour was great. 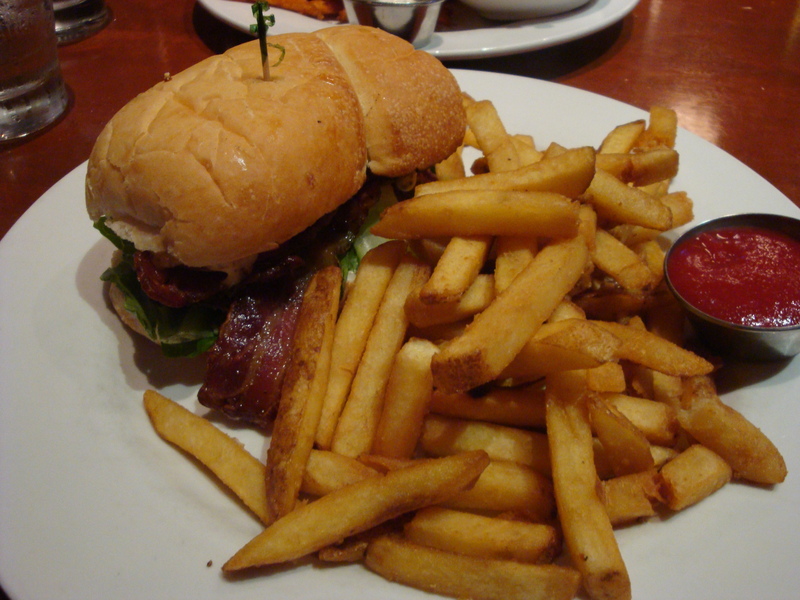 For my main course I had the BLT with truffle fries. The bread was fresh and delicious, but I wasn’t too fond of the grainy mustard mayo. The flavour somewhat overpowered the sandwich. The bacon was phenomenal, though. It was crunchy and tasty, and was definitely high quality. 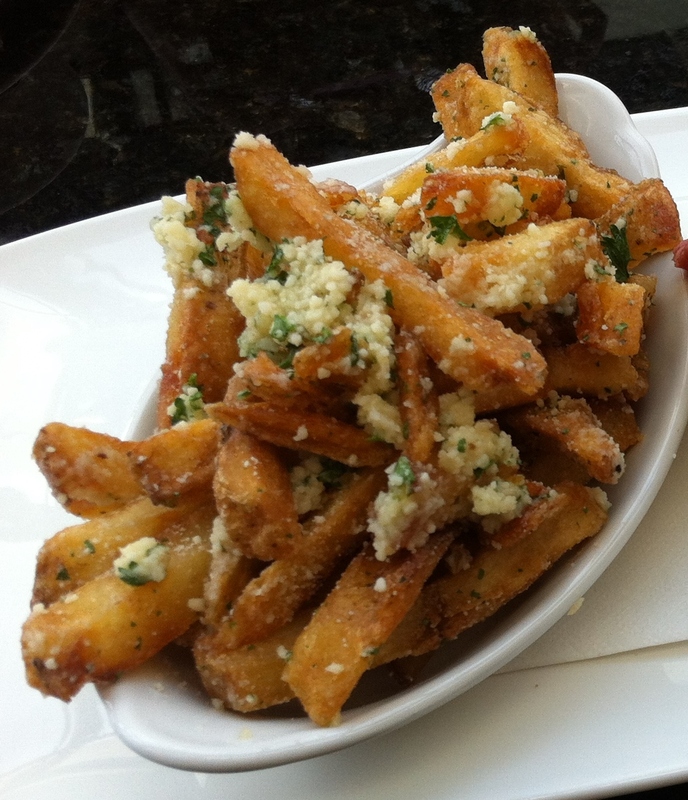 I was a bit disappointed by the truffle fries. The flavour didn’t add much to the fries, and wasn’t really worth the additional cost. Despite my few disappointments, it was a great lunch for a fairly reasonable price. My friend had the Grilled 9 oz Sirlion with a salad and yam fries. The steak was cooked perfectly and had a slight seasoning of salt and peppercorns. She really enjoyed the salad, and liked the fact that the dressing was tasty yet didn’t overpower and drench the greens. 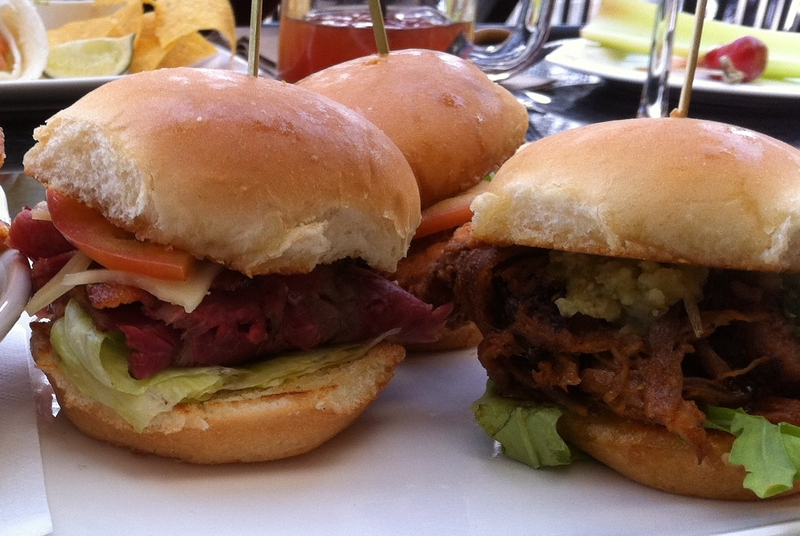 The Vault is open daily for lunch from 11 – 3, drinks and snacks from 3 -4:30pm and for dinner starting at 4:30pm. Reservations are recommended. I love sushi, and recently I had the opportunity to try a restaurant I’d never been to before. Tawara Japanese is a small but excellent sushi restaurant in the Panorama Village complex on 152 St and Highway 10 (56 Ave) in Surrey. On one side of the restaurant are 3 booths, while the other side is more open seating, as is the centre of the restaurant. The ceiling is very high, which allows a lot of light to shine through, especially when it’s a sunny day (like one of the days I ate there was). I loved the contrast between the dark wood of the chairs and tables and the bright white walls. The staff is very welcoming and friendly, and the service is fast and efficient, even during the lunch hour rush. Miso soup – Had nice flavour and big pieces of seaweed, which I enjoyed. Rice – I never got this for some reason, but that’s okay because I had MORE than enough food as it was. Tempura – Very crisp, piping hot and not greasy at all. The prawn was HUGE, which was a nice treat. Daily special – I’m unsure what it was that day, but it was warm & delicious. Tuna, maybe? Salad – I love Japanese salad dressings – they always have such unique flavours. Theirs definitely had ginger and poppy seeds in it. Fruits – Orange slices, which are kinda hard to mess up. When taking my order, the waitress asked if I wanted fish eggs or not. I didn’t know what she meant by that and was too embarrassed to ask her to elaborate, so I said no. A woman sitting next to me had the same thing but WITH fish eggs. When her platter came I noticed there were fish eggs on her Dynamite Roll, which I would have enjoyed. Oh well – now I know for the next time! 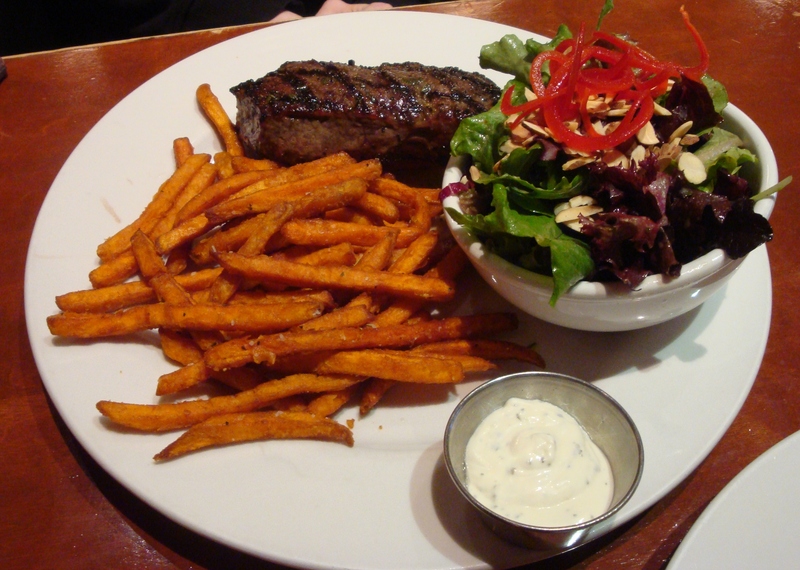 I took a picture of the meal on my cell phone, but when I went to go retrieve it, it had mysteriously disappeared! You’ll just have to take my word for it that it looked (and tasted) fabulous. The second time I went I decided to try a different roll – one that I’d never had before. I got the Red Dragon Roll, which is spicy tuna, deep fried prawn inside; smoked salmon, seared tuna on the top with peanut-mayo, wasabi-mayo & Japanese plum sauce. The flavours in this roll were incredible. The tuna was definitely spicy, which was nice. I enjoy spicy things, but sometimes I find that restaurants call things spicy which turn out to be NOT spicy at all. This one had PLENTY of bite! The inside of the roll was pretty much like a Dynamite roll, but the additions on the outside and the sauces on the plate kicked it up a notch. The heat of the spicy tuna and the wasabi mayo definitely made me grateful for the soothing cup of green tea to calm my burning mouth down. The plum sauce on the side was so interesting – I’ve never tasted anything like that before. It was sweet and tasted of plums, but definitely had a bit of a punch to it. Tawara is open for lunch on weekdays from 11:30am – 3:00pm, and for dinner Monday to Saturday from 4:30 – 10:00pm. I can definitely recommend this as a great place for sushi if you’re in that area. Last week I went out for dinner at the Rockford Wok Bar and Grill. It opened in Langley a few months ago on the corner of Willowbrook Dr and 197 St (in the building where Moxie’s used to be). I’d heard about them at a wine and beer tasting event that I went to in the fall, and had meant to check them out eventually. Finally I got the chance. 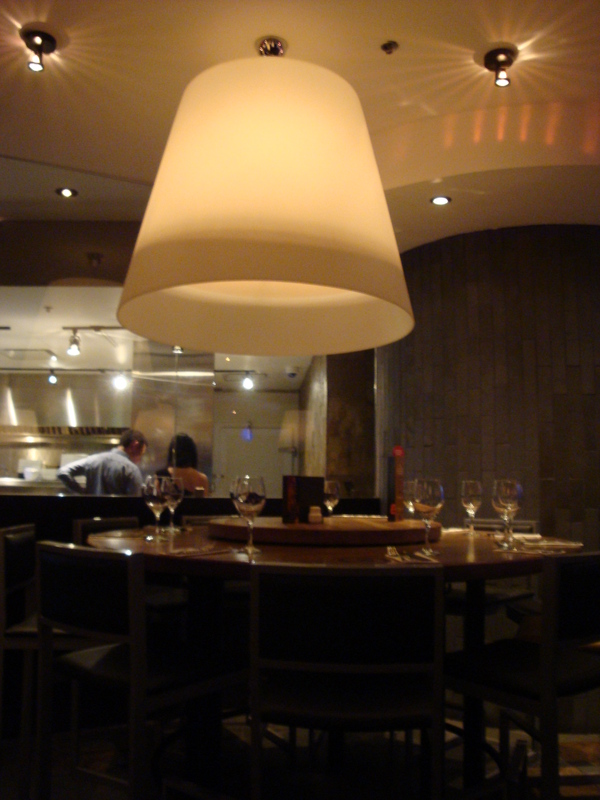 The restaurant is very open and spacious, and I think it’s bigger than what Moxie’s was. The atmosphere is great – there are huge white lamps that hang from the ceiling, and the dark brown wood looks great in contrast. They have a bar/lounge area as well as a dining room, so if you’re looking to watch a game while you eat, the bar is definitely good for that. The menu is really interesting. They have a wide variety of food to choose from, and everything sounded so delicious. Our group started off with the Steamed Edamame. I’ve had this dish many times before, but this was one of the better servings of it. 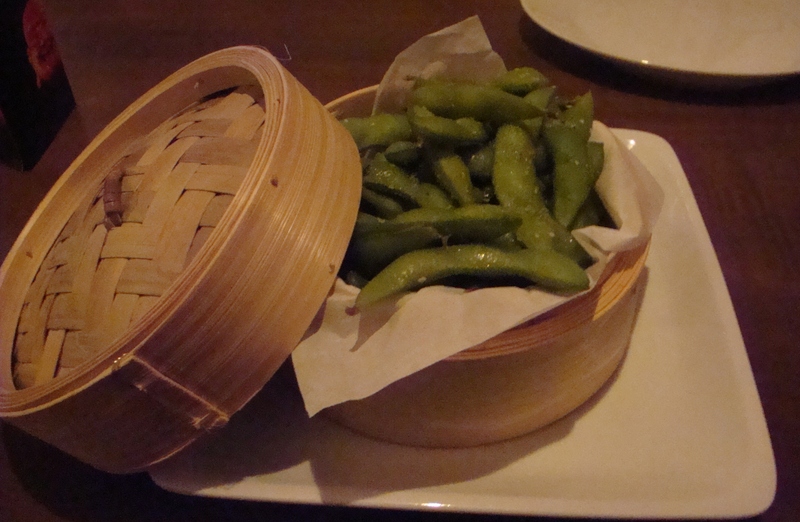 The edamame was steamed perfectly, so it was very easy to pop the soybeans out. There was just enough salt to give it a bit of flavour. For my entrée I had a hard time deciding. 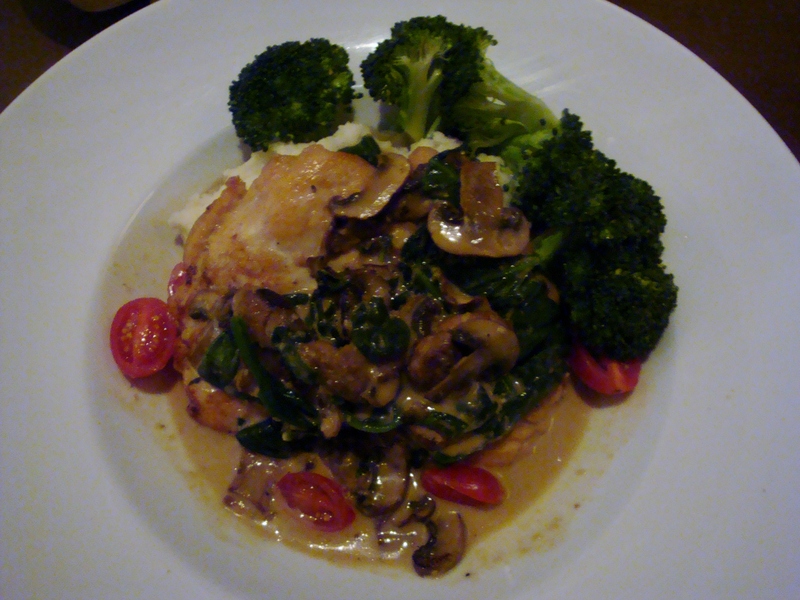 I was thinking about getting the Ramen Noodle Bowl, but ended up with the Mushroom Chicken: pan seared double breast in a crimini mushroom cream, with broccoli, fresh basil, grape tomatoes and spinach on garlic mash. The colours were so vibrant and beautiful in this dish! The chicken was perfectly cooked and the garlic mashed potatoes were probably the best mashed potatoes I’ve ever had in a restaurant. However, there was something left to be desired by the mushroom cream. The flavour was very light and subtle, but it could have used a bit more oomph. My dad had this dish as well, and we both spent some time trying to figure out what would have made the flavour better – maybe wine, butter, more mushrooms? We couldn’t decide. This was a great dish, but the cream was a bit on the boring side. My mom decided to have the Bacon & Blue Cheese Burger, which she really enjoyed. She commented that there was a LOT of blue cheese (not a bad thing). The flavours were good, and she loved the picked cucumbers. Instead of fries she got the Rockford Greens, and she thought the grapefruit-ginger vinaigrette had a unique and delicious taste. She mentioned that the burger was a bit dry, but overall it was excellent. We were sitting right near this huge circular table that seats 10 and has a Lazy Susan in the middle, which makes it perfect for sharing. I really liked the vibe in here, and our server was attentive and put up with our table’s weird quirks very nicely. I’ll definitely be back again! 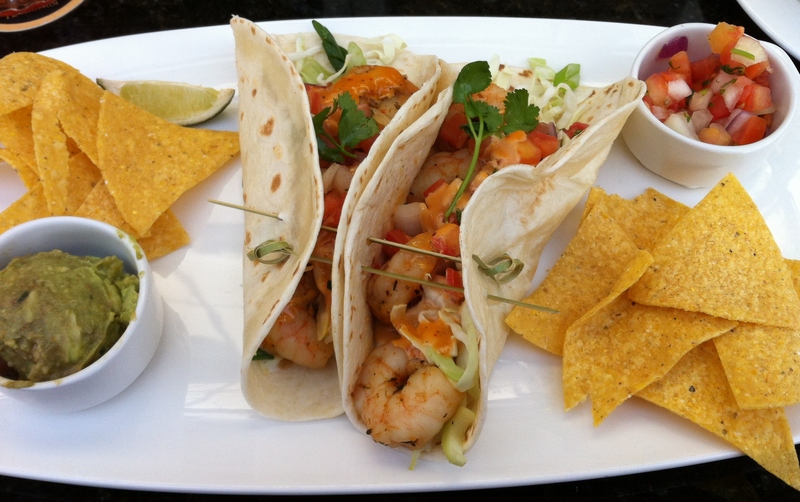 Last night a friend and I went for dinner at Azul in Aldergrove. Neither of us had been there before, and I was looking forward to trying something new. I looked up a bunch of reviews, and everything I read was positive, so I had a great feeling. The restaurant is on the corner of 270 St and Fraser Hwy in Aldergrove. It’s fairly decent in size, and there’s a lot of open space. Most of the seating is in booths, which have extremely high and straight backs, so you have a bit of privacy from the people dining around you. 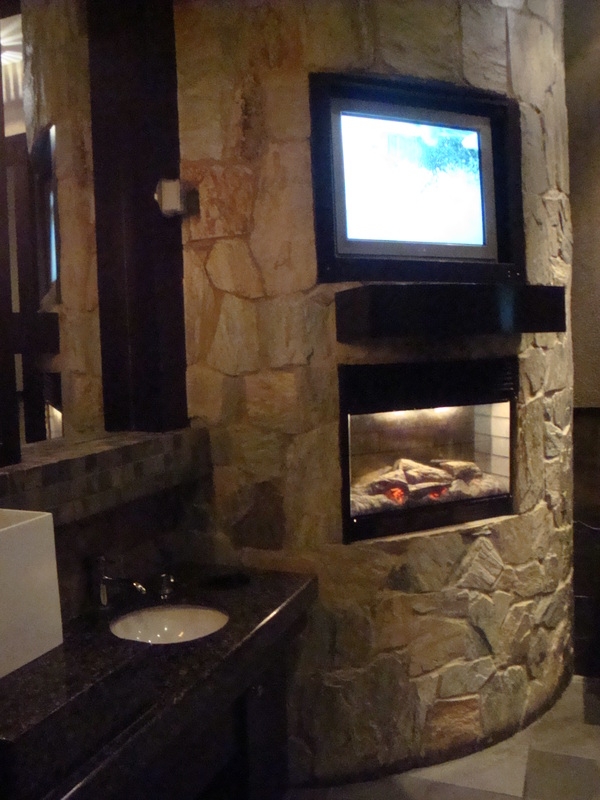 They have several large flat-screen TV’s in the corners of the restaurant, as well as some right up at the bar, so it seems like it’s a great place for watching the hockey game or any other sporting event. Unfortunately both of us were left a bit disappointed. The service was fine, but the food was mostly uninspiring. 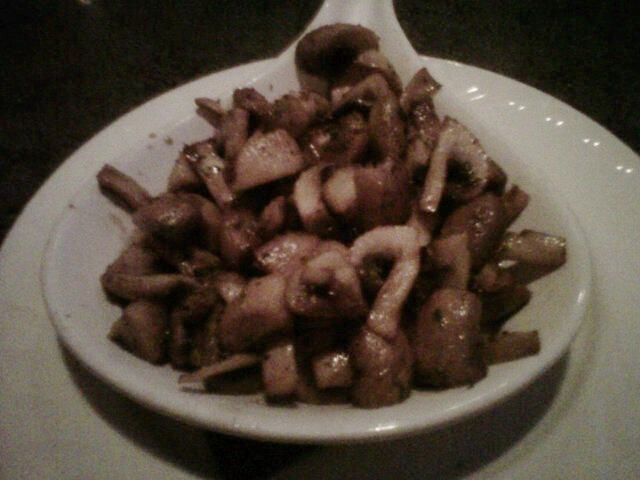 I started out with the skillet of garlic mushrooms, which was the best thing I ate that night. They were perfectly cooked and tasted fabulous. I’m on a huge mushroom kick at the moment, so these were right up my alley. For only $4.99, I was pleasantly surprised at how enormous the plate was. Please excuse the crummy picture quality. I forgot to bring my camera, so I had to resort to using my phone. 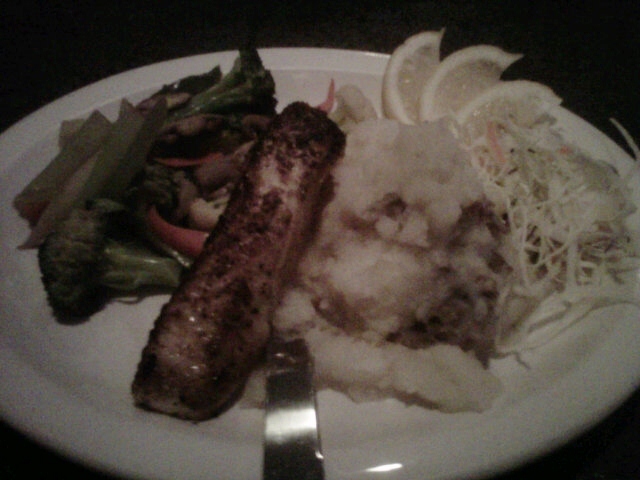 For my main course I had the Lemon Pepper Halibut. The plate was unfortunately quite a disappointment. The portion of halibut was fairly small, it was overcooked and dry and it tasted more like salt & pepper halibut. I suppose I could have squeezed the lemon wedges over the halibut, but I assumed the lemon flavour would already be in the fish. The sauteed veggies were okay (the broccoli was the best), and the plain cabbage (which I suppose they were trying to pass off as coleslaw) was just confusing. The garlic mashed potatoes were pretty good, though. There weren’t a lot of people in the restaurant, but we left just as the Canucks game was starting, so maybe more people showed up to eat and watch the game. They have a fabulous sounding menu with great prices, but I think they probably specialize in the more pub-style selections. My friend had the Grilled Teriyaki Chicken, and she was disappointed in her dish as well. My overall impression was “meh” (Simpsons reference). Maybe it was an off night for the kitchen, since everything I’d read about their food was so positive, but I wasn’t too thrilled. If I make a return visit, I’ll definitely be sticking to the appys or burgers, in the hopes that those would be better than the entrees we tried last night. Today I had lunch at Tokyo Sushi. It’s a small but fabulous Japanese restaurant in the red-roofed building on the corner of 64 Ave and 204 St in Langley. I used to eat here ALL the time a year ago. Back then our office was in that neighbourhood and I’d eat lunch there at least a week. Now that I’m no longer working in that area, I haven’t been eating Japanese food as much. I definitely miss it! If you’re looking for a great sushi place in the Langley area, I highly recommend Tokyo Sushi. They open at 11:30 every day except Sunday, and they have a fantastic and varied menu for either lunch or dinner. Their prices are very reasonable, and the staff is lovely and welcoming. I hope to go back again soon! This morning I went to Wendel’s for breakfast. I had a Groupon that was expiring soon, and I didn’t want that to go to waste. I’ve eaten breakfast there before, but it’s always been after I’ve run the Fort to Fort trail with my running group, so I’d usually choose a super healthy option (fruit plate, oatmeal, etc.). Today I was in the mood for something extra tasty and comforting, especially since the weather was so horrible. The cafe is in Fort Langley, which is a cute little neighbourhood. There are a lot of shops and restaurants in the area, and Fort Langley is a historical site, so there’s plenty to see and do within walking distance. The cafe is also home to an independent bookstore, so it’s a perfect place to spend a few hours, especially if you’re looking for some great reading material. This morning the place was packed, so I didn’t take any pictures of the inside. It’s a holiday today, so that probably explained why the place was so busy. I normally go on Saturday mornings, so I wasn’t expecting the place to be so busy. Despite the crush of people, the staff were friendly and happy, which is always nice to see. Even though there were a large amount of people there, I was able to find a seat easily. I was pleasantly surprised that my meal came so quickly – the kitchen team is definitely efficient! I ordered the Classic Eggs Benedict. The eggs were perfectly poached, which I don’t often experience when ordering Eggs Benedict in restaurants. The eggs tend to be either super runny or over-cooked, but these were fantastic. The yolks were just slightly runny but firm enough for my liking. 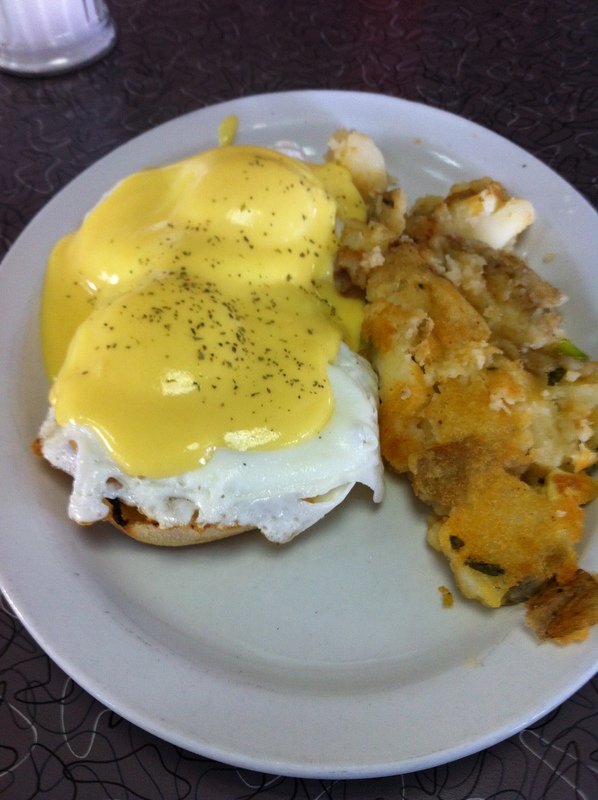 The hollandaise was great as well – it was flavourful and there was plenty of sauce. The potatoes were piping hot and seasoned well. My only complaint with the meal was the watermelon. I thought it was strange to see watermelon on my plate in November – it’s not exactly in season at the moment. The rind didn’t look that great, and the slice was a little bit mushy. But that’s a very small issue to have. Overall it was a great (and filling) meal for a very reasonable price. 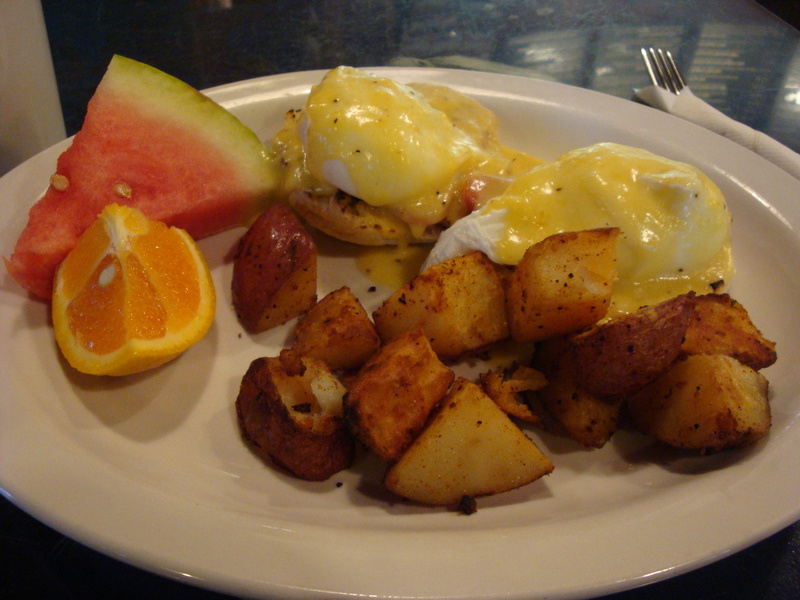 Wendel’s serves breakfast from 7:30-11:30am (12:30pm on weekends). They also have lunch and dinner menus, so you can drop by for a book and a meal/snack until they close at 10pm.